SKU: mp0001. 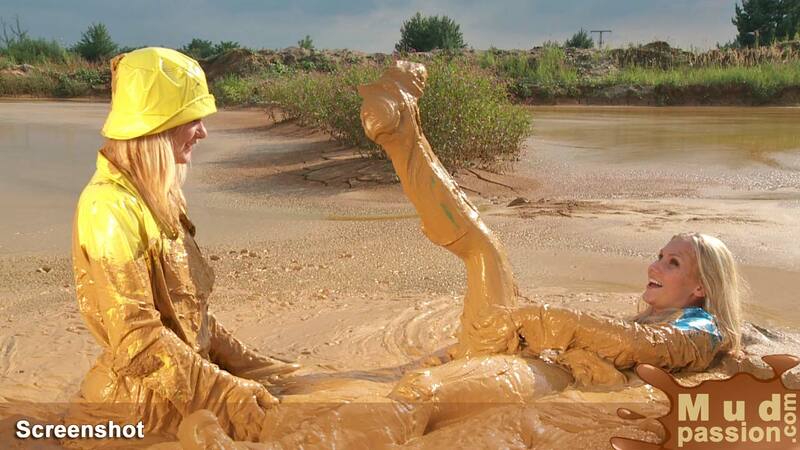 Category: Mud Girls. Lenka and Michaela are enjoying a hot and humid summer afternoon in their new rainwear outfits. It rained a lot during the last weeks and now it’s muddy everywhere. The girls have so much fun jumping through the big puddles and enjoying the warmth of the sun. They come to a big mud hole and Lenka pushes Michaela into the soft mud. Soon Michaela’s fancy turquoise rubber boots are sunk into the mud. Matching to the boots Michaela wears a blue transparent PVC rain cape on her naked skin. She feels the mud sinking slowly into her boots and pulls the sweet Lenka into the mud, too. Lenka wears a combination of a yellow raincoat, hat and yellow rubber boots with high white socks. Be the first to review “Lesbian Love in Rainwear” Click here to cancel reply.